Fitting into a theme that has permeated the symposium, Bob Metcalfe, who was responsible for developing the media rainforest’s irrigation system, the Ethernet, didn’t pretend to have a catchall scheme to monetize news. During Saturday’s opening keynote speech, Metcalfe suggested a model of micro payments in which readers make fractional payments for interesting content. “How much would readers pay for my weekly column in Infoworld?” Metcalfe asked his readers a few years ago. On average, they responded that they were willing to pay him 20 cents, but multiplied by 650,000 readers in the U.S. that equaled to a profitable weekly venture. The challenge for journalists is to get a critical mass for their content. Metcalfe differentiated between word of mouth, which consists on a network of recommendations, compared with virality, which implies that it is in the interest of the user that their friends read or belong to the same community. Virality is what Facebook and Twitter do, because users cannot share their personal information unless their friends are also part of that network. The second challenge to monetize journalism is “dignity,” Metcalfe said. He said dignity is about considering journalists as special people, with a tradition, principles, commitment to public interest and objectivity. He said journalists’ dignity doesn’t fit in startup culture, which isn’t afraid of failure. “The startup world does not respect any of that,” he said. 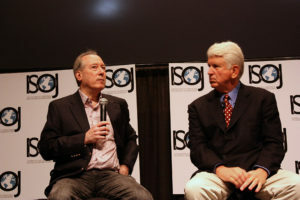 ISOJ 2012: Bob Metcalfe keynote, from Knight Center on Vimeo.